Insight on booking a Key West fishing charter. Nice yellowtail snapper Brian fishing with Me Capt. Steven AKA (Viper) of Dream Catcher Charters on board a 24ft Yellowfin Carbon Elite Bay Boat. Booking a good Key West fishing charter or a fishing charter in any town for that matter, that you do not live in or ever frequent can be daunting. Especially in Key West. Here in Key West there are roughly 165 fishing guides independent and groups that try to fish a full time schedule. Add that to the 55 or so part timers that come here just to take advantage of tourist and fishing season and you have 200 ++ guides vying for your business. Thats a lot for a town that is only 4×5 miles.. A good schedule for a full time fishing guide is roughly 200 trips a year give or take. Deep sea, flats, backcountry, family fun, light tackle, fly, wreck, reef and nearshore fishing. Its all here and there is a Key West fishing guide that will take you out and do it. Fishing guides that have little or no experience, some experience and then some that have 30 years on the water. Whats the best? 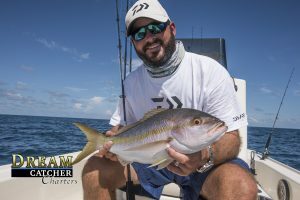 who to chose and why and how to book a fishing charter. So with all that said lets look at how an angler can effectivly search the internet for a good / great fishing guide and a great fishing experience here in Key West and avoid some of the pitfalls. As an angler searches the internet they will find all sorts of propaganda pulling them to one fishing guide or another for many different reasons. Some are genuine and most are not. Lets take a look at these things and decipher what they mean. Currently this is without a doubt the most common way of attracting customers for most fishing guides on the net. I have seen fishing guides that are 22 years old with 15 years of experience. Thats not to say a 22 year old is not a great fishing guide, quite the contrary, but 15 years of experience leads the prospecting angler to beleive the guide has 15 years of Professional guiding, this is simply not true. Here in Key West if we are using a registered boat of any kind to take people on the water we are required to have a captains license. The United States Coast guard requires the licensees must be 18 years of age to take the test. So when I see the number of year experience I ask.. So, how old are you? Say the fishing guide is old enough to have that many years of experience. Well then I am led to ask.. So, how long have you been in Key West fishing. Again.. not to say a 2 year experience Key West guide is not a good one but.. where is he from? where did he get that 15 years experience. Many of our blue water deep sea fishing guides are from other places, this is sometimes a good thing as they bring what they learned there to these waters and it makes for a great fishing guide. They are just full of crap. I know of many guides in town that tout 22 years of experience and they moved here from some other job or Colorado and the false mass marketing just gets the prospecting angler that does not do their research therefore keeping them in business. These guys come here and hound everyone in town for information to get started. Telling the locals they are just recreational guys and not ever going to professionally guide a fishing charter. They learn enough to go out and back safely then the information flow stops as the locals (real guides) get wise and next thing ya know the guy is a 20 year vet that can’t catch bait. Oldest trick in the book. Think about it.. Even if it were legit.. Why would you go with a guide that offers a “fishing” trip on that basis. If I were to hire one of these outfits I would pin him in a corner and say.. I want tarpon (for example), if I do not get one to the boat, I don’t pay… If the guide puts this on his confirmation then I might consider it. BUT.. if he is that desperate for a fishing trip to offer the “no tarpon no pay” chances are he is not fishing much. As Seen On ESPN, HBO, Or ? Really? Most of these outfits that claim this have never been on any of these networks with a tv show for fishing. How is that relevant to your needing a great fishing guide anyway? As a fishing guide I personally have done many television shows and pieces on these networks but you will never see it in my marketing for me as a guide or for my company here at Dream Catcher Charters. Its dated and pointless. Television shows are a great way to showcase the Florida Keys and Key West fishing when they fish with us and get it on film. However, many shows take several days to tape just to get the role necessary to portray a great day of fishing, most of the time they are with anglers that have been fishing their whole life and have tons of talent. To me its a false sense of accomplishment that is not relevant to the guide and your day of fishing. Lowest Rates In Key West OR $100.00 Off.. In many areas of shopping I have found – You get what you pay for. This holds VERY true in guided fishing charters. There are two reasons a fishing guide offers the lowest rates in Key West. The guide has no business and is willing to run for less just to get a trip off the dock. Buyer be ware.. At todays fuel prices these fishing guides cannot afford to run at those rates and take his anglers to the productive fishing grounds where the other higher priced guides are going. Angler suffers from a lacking trip and the whole experience is lack luster and angler goes home with bad taste of Key West fishing. Trust fund babies. I have seen it many times where some kid shows up on scene and runs at 50% off the general rates of other fishing guides because he does not have to make a monthly nut. Mommy and daddy said.. Son, you get your degree in college we will buy you a boat, house and web site so you can chase your fishing dream – But you have to finish college first.. Two things happen here. These kids wash out from the Key West experience after they realize that being a fishing guide is really hard work OR.. They make it and through the “earn while you learn” program turn into decent fishing guides and realize the rates need to come up to stay alive after the boats start aging and mommy and daddy cut them off. NOTE: If a fishing guide is publishing rates that are competitive but a little less than the rest.. This is not what I am talking about. That is just being competitive. HERE IS A TIP: If a guide is unwilling to budge on his price that means he is staying busy and values his charters well enough to let you go find a cheaper one. Probably a good bet to pay a little extra and be very particular on how you tip according to his performance and weather or not they live up to the price. Most likely you will be very satisfied. How do I ask For a Discount? As a fishing guide for 22 years professionally I have been approached many ways with this. The best ones are the anglers who ask… Are there any discounts available? This allows me to discount if I want (generally don’t). Letting me keep the fish is not a reason for discount, we do not, nor are any of us allowed by law to sell fish caught on a charter this is a bad road to go down. This is so unproductive. It happens all the time. Our best marketing is when our competitors talk to prospecting clients about us. We get the trip 90% of the time. Don’t book with a company that talks crap about their competitors. It just means they even think they are less of a value. Relatively new are the internet reviews on Trip Advisor. These can be good and bad ways to chose a fishing guide. Here is a good guideline. First off see how many times a guide has been reviewed, this will indicate how long they have been in business. For example Dream Catcher Charters has well over 700 Trip Advisor reviews, more than any other charter service in Key West. That said, we also run more charters than anyone in Key West. We ask our clients to leave comments but we don’t push it by offering free stuff to them which is against Trip Advisors guidelines. Good Reviews are great.. But.. read them, several of them. if they seem canned or repetitive this is a guides way of scamming the system and pumping up the ranks. Canned reviews will be the same length and lacking detail, people who truly want to leave a comment will embellish all nuances of the experience. Read them and you will see what I mean. Also.. don’t be afraid to contact those travelers with your questions. If they do not answer you back.. chances are.. they were bogus. Bad reviews are just as important as they show not only what the angler had to say about their day but you will see what the guide reposted in his managers response. This will offer you as a prospecting angler a chance to see what kind of character you are dealing with. What the guide did to help remedy the situation and of course how bad the guide screwed up. If a fishing guide has 200 + reviews and they are all 5 star… BUYER BE WARE! We all make mistakes and have bad days or customers that are just impossible to please.. Thats the real world of guiding. Rank is evaluated on percentages of good and bad reviews. Read 2 and 3. This is a great question. There are four different ways to book your fishing guide. Internet Booking Company– Conglomerate web sites that represent all sorts of fishing and guides you call they book you. Rates are generally the same as the independent guides published rates on his own web site. Advantages – Most of these operations keep up on their guides and charters very well. Knowing who’s hot and who’s not insuring quality control and customer satisfaction. A huge advantage when angler call. Some of these operations offer a guarantee of professionalism or money back. Fishing guides go through life just like the rest of us, divorce, addictions and other issues that will distract them from showing a great day on the water. Booking companies have a pulse on this daily and (if they are good) will steer you around these issues. Disadvantages – There is good and bad on everything. the bad here is some of these companies charge you booking fees, don’t follow up with bookings leaving you without a trip, don’t offer confirmations or allow you to get in touch with the fishing guide. Just do your diligence to make sure they are on the level. Hotel Concierge– Every hotel, resort, guest house and bed and breakfast has one or at least a person that acts like one. Rates here are the same as the fishing guide will charge you directly. Advantage – they are at your hotel. They can make the call to favorite guide and get you fishing. Disadvantage – With a few exceptions they know nothing about fishing here. The guides they chose are the ones who will pay an excessive commission and a little extra under the table. (see Discount guides). Rarely has anything to do with the quality of the fishing guide. Street booth Sales “Hawker”– Duval street has about 50 of them. Rates are the same as the guide charges directly. Advantages – There are none……. Disadvantages – EPIC FAIL! Book here and not only get the bottom of the barrel of fishing guides but no guarantee he will even show up. These people work for the sale, not your experience with a fishing guide. Guides pay HUGE commissions to be booked here and is considered to be the slums of marketing. NOTE.. With all things there are a few exceptions. but I would do everything in my power not to book with one of these outfits. There are too many other options. Advantages – Hear the guide sell himself and get to know him on the phone from HIS perspective about his services. Great way to go on recent word of mouth. Disadvantages – you are only hearing HIS perspective on himself. Some guides are not super organized, bookings are done on a bar napkin and some cannot take a deposit on credit card. Most do not send a confirmation that stands as a contract from you to them for you day. You are not protected in most cases. TIP: Call two fishing guides in your shopping. Ask them about each other. Go with the one the other guide bashed. If they both bash each other then keep looking. If they don’t, you have found two good fishing guides. I own the largest “legitimate” guide booking service in the Florida Keys. Its called The Keys To Key West. We have been booking guided fishing charters since 1997 off of internet call ins. We handle over 5000 fishing charters a year in our office. Here are the things we do to set ourselves apart from the others. Signed confirmations that we stand behind with directions and information about who, what and where. Money back guarantee for professionalism, equipment satisfaction and overall appearance. Full time Local staff that knows all facets of fishing managed by veteran fishing charter booking agent and my wife “Island Genn” who has a vested interest in your charter. Full on customer service that does the extra mile for you with restaurant reviews, coupons, activities, accommodation recommendations and local friend. So that might clear it up a bit. If not just give us a call and we will help you out. We have found that if we focus on people having a great fishing experience instead of chasing the dollar, we win anyway.